‘Today it’s inviting: blue-black water glinting in the blue-grey light; the surrounding space expanded by the view through denuded winter trees; the soughing of the rapids like a lullaby’ (p.23). Sometimes it is the unexpected that brings joy and a smile to my face as I read: a cormorant spotted on a river rock, far inland from their normal sea home, an ewe and her lamb bleating noisily along a path as Lynne and Honey make their way back from a swim. The central theme of the book for me is not swimming, at least not in the physical sense, but community. Lynne’s swimming adventures are always buoyed up by others, even when she is swimming alone, her dog Honey is close by, snuffling in the undergrowth or having to be pushed up after jumping in a little too enthusiastically. Ever present in Lynne’s writing are other people – a cast of characters that includes close friends, other wild swimmers, dogs, occasional children, surfers… In many entries it is less about the swim, although the water is always there, and more about the people, the community that make such adventures fun, sharing daring plunges into the sea, laughter as someone is swept unexpectedly into a river pool, hikes across the moors, and tea and cake to warm up after. Everywhere in the book there are people, a community, belonging, sharing. These meetings of like-minded swimmers, joyously exploring wilderness seem an increasing rarity in our day and age, when we are connected always and often not at all; where we are warned about risks and danger, never daring to swim outside the buoys. Lynne talks about the risks of wild swimming, shares her knowledge of sea currents, river temperatures. Risk is always there, but it does not stop the going. ‘A coterie of wild swimmers gather in later afternoon on Slapton Sands. It’s a stunning day, but a cheeky easterly wind knifes through skin and bone as we trot to the sea. The waves rear up and dump in a clattering roar, and the shingle tinkles like rain as the waves recede. […] We return to shore and take turns to soak in the portable wood-fired hot tub placed here for the day. […] Heat diffuses through our chilled skin. Meanwhile the salty Slapton gale whips past our faces. The briny scent mingles with whiffs of wood smoke. We wallow and giggle, cooking slowly while we drink champagne, eat a series of exceptional cakes, and finish with coffee and Baileys’ (p.86). Who could not be drawn into the sea in October when such rewards exist? Towards the end of the book entries become sparser, less frequent. Lynne battles injury and later imbalance, caused by a brain tumour, that make her wary in the sea, anxious she will not be able to react how she could/should/used to. These entries, with a self-awareness that is poignant, are sad and truthful, reality of life encroaching on the freedom the water brings with it – a freedom that is at once liberating and potentially fatal. ‘If you’re by water, stop, close your eyes, and just listen for as long as you can. There is no single sound, no permanently dominant noise but rather a soundscape map that you can follow with your ears as the water moves. Beneath the roar here, there are distant wafts of gentler soughing, tickles and inkles, the champagne fizz of dissipating foam, a sudden boom as a wave crashes on a reef’… (p.163). The diaries are a snapshot, a moment in a life, filled with joy and friendship, grief and cold seas. 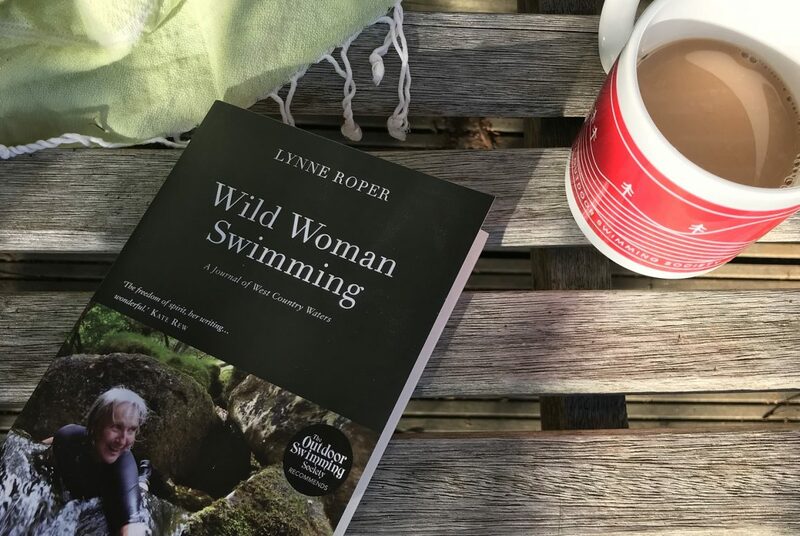 If we could all find something we are happy doing, as Lynne so clearly was in her pursuit of wild swimming, then I suspect we would all feel more content with our lot. I read this book with a smile on my face all the way through, my mind filled with the colours of Dartmoor and its rivers and seas, the laughter and shrieking of friends as they plunge into cold water together echoing in my mind. Read this book and then plan a trip with your friends to these places, I know I want to swim where Lynne swam, and see the places she wrote about so beautifully. Join me?